We went out for lunch and sat on shady patios eating amazing pizza (check out post here). We took in our library's annual book sale where Mom and I enjoyed a delightful time browsing tables laden with reading possibilities. And, when we arrived home, there was that sheer joy of opening our bags and thumbing through the piles as we decided which book to start with first. As you can see, I come by my love of books and reading naturally! All too soon, it was time to pack up the car with mom's suitcase and bag of books, and take her home. When I went back into her bedroom later that afternoon, I experienced a sudden wave of homesickness. I keenly felt the empty space in our house where just hours before Mom had been sitting and laughing and joshing us, especially with Rick -- they both give as good as they take. I was homesick for her and I wanted to turn the car around and bring her back. For, I'd caught a glimpse of what life would feel like without her presence in our lives. It was just a split second, but I felt it like a sharp knife. The moment passed and life went back to 'normal', but I've never forgotten that moment -- and today I'm reminded again not to take for granted that there's all the time in the world for sharing and loving and memory-making with my own dear mom. I'm so grateful for my mom. I'm grateful for her love over my lifetime. She's been a rock and faithful to her call as a mom -- she's shown her kids how to be faithful, loyal and compassionate to others. Today I'm ever so grateful that I have this precious opportunity to celebrate another Mother's Day with her. 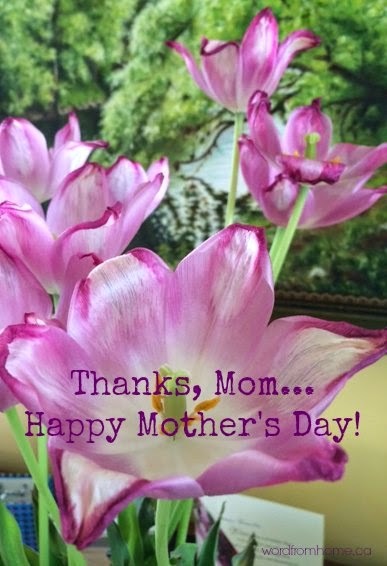 To all my beautiful friends, may you enjoy your mom today. Whether in person, by phone or by Skype. Or, for those of you whose Mommas are no longer with you, may there be memories that come to bring joy and comfort on this 2015 edition of Mother's Day. After 20 years I still miss my mother deeply. How lovely to have that precious time with your mum. I agree! I hope one day to be able to spend more time with my mom! I'm missing my mom today too, and you reminded me how wonderful it is to have a mom, even if she's in heaven. Thanks, Brenda. I think it's rare to have the kind of mother-daughter relationship you describe, though I am thankful I have it with my daughters. Yes, let's be thankful and enjoy these most important people while we have them! Everyone has had a mom. She is either in your life or not. And when she isn't, it's a sad thing. Enjoy your time with your mother. She sounds like a wonderful person to be around. This was lovely. My sisters and I inherited our mother's love of reading. I love the expression on your mother's face with her arms full of books. Great pictures of your mom! Hope that you have more fun times planned for this summer. Such lovely words from my beautiful daughter, Thank you Brenda, and I am hoping to spend sometime in summer with you again. Love you sooo much !! I love the photo of your beautiful mom with the books. What a delightful time you had together last summer. I hope it will be repeated this year, too. Moms are so special and I'm glad I have mine. What a sweet tribute to your lovely mom! 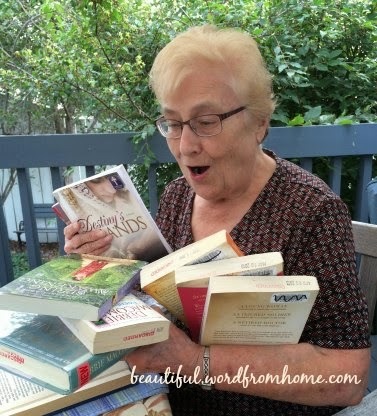 I absolutely love the photo where she is expressing such delight with her book finds! mother's day without your own mom is n't the same although my son and I spent some time looking through a history I wrote of her life. Your mom looks like a really fun person!!! 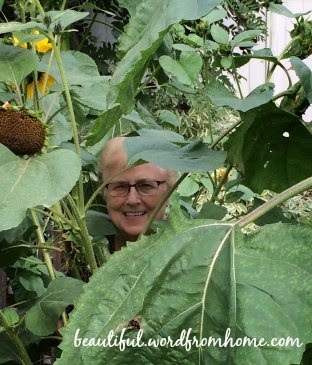 I love the photo in the sunflowers.... she is bringing sunshine of her own, isn't she?! And her expression with the books is priceless! I love the photo of your mom with the books, Brenda. What a lovely tribute. Thanks to all you beautiful friends for your lovely comments. Nancy, my mom really is a fun person and she does bring sunshine into our lives. Violet, I was hoping you'd notice that she was holding a copy of your novel; we were both excited to find it -- she'd read my copy but was happy to find one for her own shelf. We're looking forward to new summertime visits. What a beautiful Mother's Day post. So special that you and your Mom share a love of reading. My Mom and I used to talk about food, cooking and recipes (even when I didn't cook much). I miss her every day!